Education is a vital part of the research cycle and I am always looking for opportunities to get the public involved in whatever I am doing, because if they are not invested in our research and our natural resources, we’re not going to have these amazing animals and places to continue to study and explore. I’ve given dozens of public bird banding demonstrations with Hobbs State Park, Black Swamp Bird Observatory, Green Creek Wildlife Society and Pioneer Scout Reservation. I take every opportunity to work with the public and teach them about whatever project I am involved with. During my PhD I coordinated monthly bird banding programs at Hobbs State Park, “Birds and Breakfast” to groups of 40-180 people. 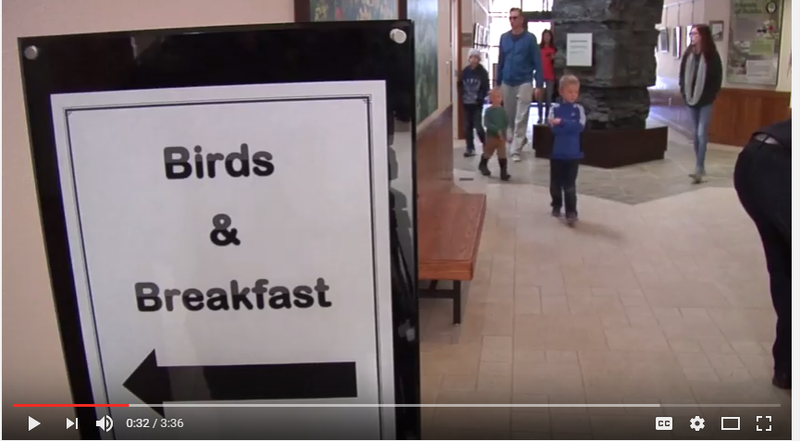 Click on the below image for a video by Arkansas State Parks about Birds and Breakfast! I’ve been a Teaching Assistant for field based courses, and worked one on one with students a various levels (undergrad – graduate) on improving their scientific writing. I believe in engaging students where they are and helping them understand WHY what they are learning is important to their lives. The Scientific Method and evaluating the world around you, is important to everyone, understanding details of mitosis, depends on the person. I worked four summers at Pioneer Scout Reservation as a member of their ecology staff. In addition to teaching daily merit badge classes, leading nature hikes and doing bird banding demonstrations I helped found the camps conservation program, getting the youth involved with sustainable projects to improve the camps water quality, remove invasive species and improve trails. I greatly enjoy working with people of all ages, during my undergrad I led a committee to plan twice yearly badge days for local boy scouts, bringing in youth from all over the Upper Peninsula of Michigan for an outdoors based day of fun and learning. As a grad student and now as a postdoc I try to reach out as much as possible to the local community to teach them about my research and I try to write as much as possible about it in a variety of forms (newsletters, blogs, maybe someday magazines) so not just scientists have access to what I do. Looking for an enthusiastic scientist to speak to your class, group or organization about ecology, birds, science or science careers? Just let me know (aurielfournier@gmail.com). If you’re near me I’ll come to you, or we can try to set up something over Skype!